VietPress USA (June 18, 2018): As of May 2, 2018, Donald Trump has told more than 3,000 lies to the American public since being sworn in as President of the United States, setting a new record for both himself and the office of the Presidency. This amounts to roughly 6.5 lies per day, meaning that the frequency of the lies is increasing. Ring of Fire’s Farron Cousinsdiscusses Trump’s lying problem, but also the problem of the supporters who blindly believe these lies. If there is one thing that Donald Trump does better than any other president that came before him, it’s lying to the American. Just 466 days into his presidency, the Washington Post released a report showing that Donald Trump had lied more than 3,000 times in those first 466 days of his presidency. In fact, it was 3,001 lies that he had told to the public in those 466 days. More lies than any other president in recorded history for the United States of America. Another milestone for Trump. He is officially the most lying, dishonest president that this country has ever had. Those 3,001 lies, which at this point it’s actually more than 3,001, amount to 6.5 lies per day.(https://trofire.com/2018/05/02/trump-sets-new-record-by-lying-to-americans-over-3000-times-in-466-days/). 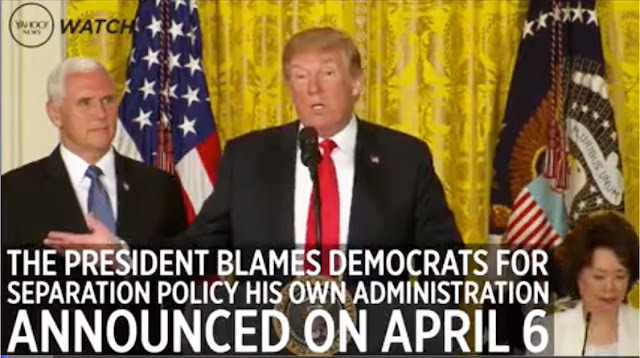 Today on Monday afternoon, June 18, 2018, in an address to the National Space Council at the White House, Trump performed another big lie when he continues to blames Democrat party for the family separation crisis caused by his immigration policy declared since April 6, 2018. President Trump on Monday again tried to shift blame for his administration’s controversial policy of separating immigrant families at the border to Democrats, while others in his administration threw up a variety of confusing, misleading and sometimes contradictory explanations and defenses. There is no U.S. law requiring that the children of immigrants entering the country illegally to be separated from their parents. The administration, unlike previous ones, is treating the adults as criminals and jailing them, which requires them to be separated from the children. In an address to the National Space Council at the White House on Monday afternoon, Trump continued to blame Democrats for the family separation crisis while ratcheting up the rhetoric. Trump’s comments come amid growing bipartisan backlash over the Trump administration policy that has resulted in 1,995 children being separated from parents who are accused of illegally crossing the U.S.-Mexico border between April 19 and May 31. According to Quinnipiac University poll released by Monday, 66 percent of American voters oppose the policy of separating children and parents when families illegally cross the border, compared to 27 percent that support it. On Sunday night, Homeland Security Secretary Kirstjen Nielsen pushed back against mounting criticism by denying that the policy actually exists. On “Fox & Friends” Monday, Hogan Gidley, a special assistant to the president, said the policy of separating children from their parents is “all the Democrats’ doing.” But recent comments from members of the Trump administration would indicate otherwise. In April, Sessions announced a new “zero-tolerance policy,” which he described as an “escalated effort to prosecute those who choose to illegally cross our border.” Under Sessions’ directive, all those apprehended for entering the United States illegally — including families with small children — would be criminally charged. Last week, Sessions responded to criticism from church groups and religious leaders, citing the Bible in his defense. “I would cite you to the Apostle Paul and his clear and wise command in Romans 13, to obey the laws of the government because God has ordained them for the purpose of order,” Sessions said. “Orderly and lawful processes are good in themselves and protect the weak and lawful. Last week, Sanders also cited the Bible in her defense of the immigration policy. Sanders also insisted that ripping children from their parents is a moral practice. “It’s a moral policy to follow and enforce the law,” she said. In an interview with NPR last month, Kelly said that the “name of the game” is deterrence. During a background call with reporters Friday, a spokesman for the Department of Homeland Security echoed Miller’s sentiment.